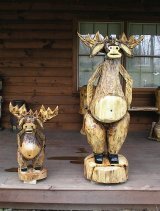 Just up Stratton Lane from Stratton House Inn is Ed Maciecayk's open-air museum featuring his chainsaw creations. Click images to display larger versions. In the fall of 2002, Ed Maciecayk took up chainsaw sculpture as a hoby. Now, years and many, many sculptures later, his artistic creations are drawing wide aclaim. His works will be found in museums and featured in businesses and private yards. 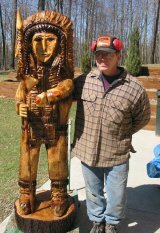 Ed creates smaller-scale works at home, but also custom crafts artworks from large standing trunks of trees. Backgroound: Ed is a food equipment engineer specializing in process design and equipment fabrication. Well known and widely respected in his field, he quickly is becoming equally well-known for his hobby. Ed loves working with wood, feeling through his art that he is able to bring something dead back to life.